A professional Solar Graphics team installed a decorative Etch Frost Window Film design on the Houston Police Museum in March 2010. The installation process took a total of three days. It was installed on the inside of the glass and covered with a 2mil Clear Film. Watch the video below. Enjoy! Below is a video showing the design and installation process of Solar Graphics window film graphics on the Camp Nessie Children's Day Care Center at the Innisbrook Golf Resort. It walks you through the steps taken to design a layout and what needs to take place to reach the finished product. Enjoy! Below is a video showing the design, prefab, and installation of an auto parts store in downtown St. Petersburg called Broadway Auto Parts. This video focuses more on showing the prefab and weeding process. Also showing in detail the steps involved in installing prefabed graphics on the outside on the glass. 2 mil clear UV film was placed over all the windows to protect the graphics. Below is a video showing the Solar Graphics team install window film graphics and digital UV prints on clear window film on SuperValue Nutrition in Sarasota, Florida. Also shown is a detailed step-by-step door logo and border application. As Solar Graphics' premium Colored Window Films are growing in recognition, they are being used by more clients in more ways. Solar Graphics had the amazing privilege of doing a window film graphics for the 1996 Olympics. A enormous team was sent up to install a large graphic of the Olympic rings, as well as five graphics on the Georgia Dome. 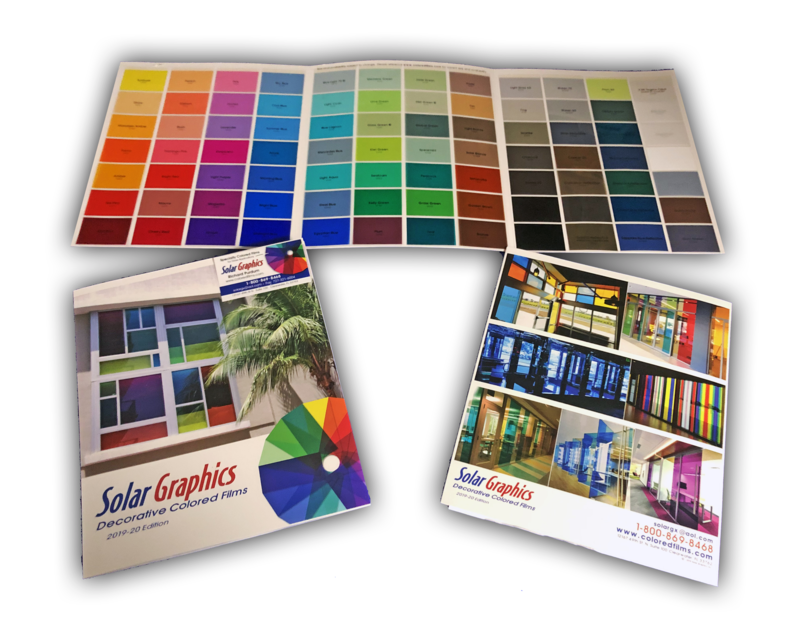 As the years passed, Solar Graphics window film popularity grew... resulting in 1,000s of storefront, residential, and commercial colored window film graphics and tint. 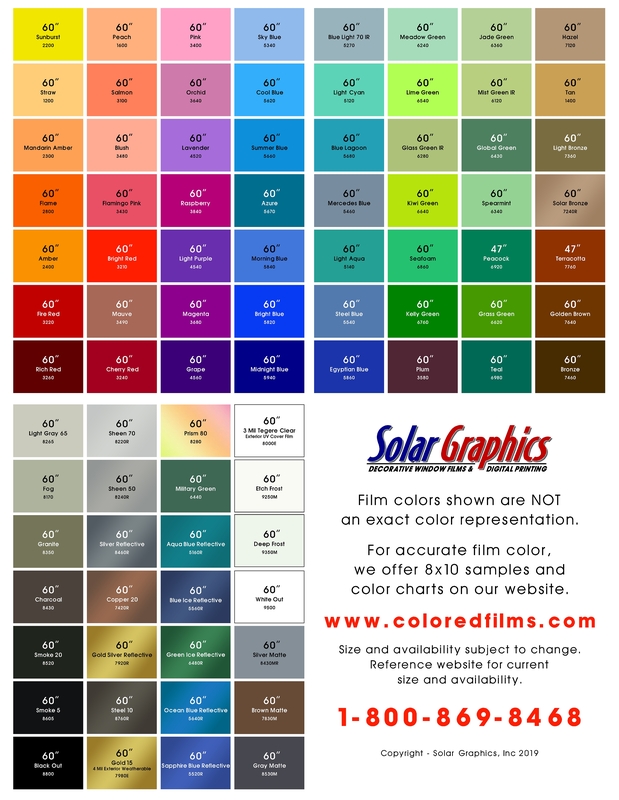 On July 31, 2007, Solar Graphics received an order from Twentieth Century Fox pictures for 700 linear feet of Light Cyan and 300 linear feet of Seafoam. 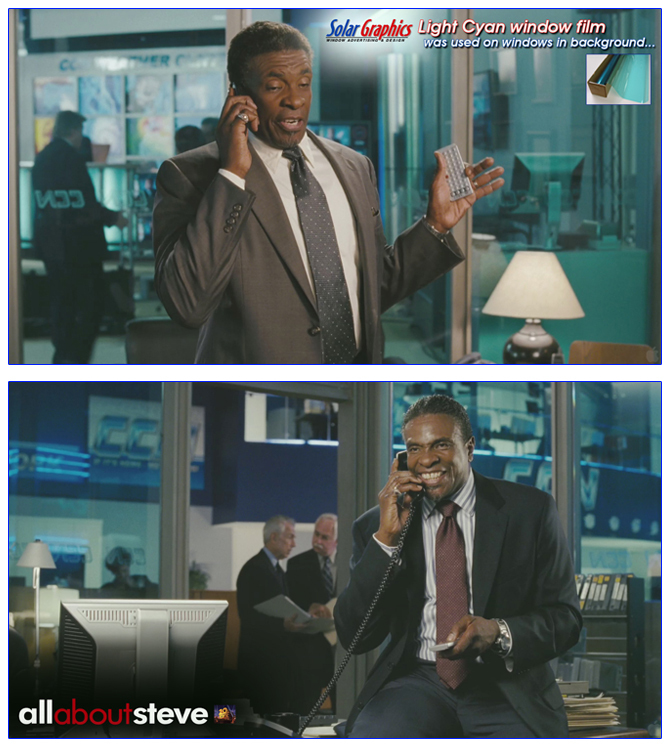 The film was to be used on glass windows in select scenes of the new Sandra Bullock movie All About Steve. We shipped the film and the company had local tinters install it. Below are scene shots with Solar Graphics' Light Cyan window film in the background. Solar Graphics designed a window film storefront for the Caribbean Cafe restaurant in June 2009. The storefront was one of several that naturally catch the attention of the public. The impressive reflective graphics brought more people into the restaurant and increased customer revenue. 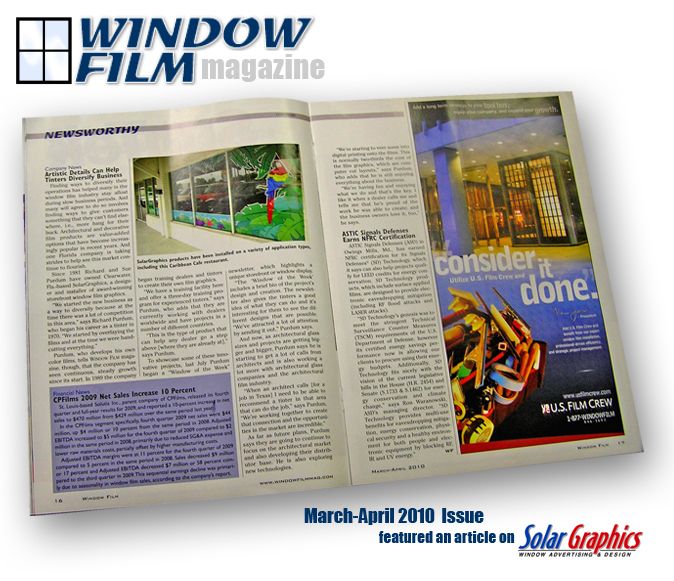 The storefront was featured in Solar Graphics' Windows of the Week newsletter and Window Film Magazine (March-April 2010 Issue). Finding ways to diversify their operations has helped the industry stay afloat during slow business periods. And many will agree to do so involves finding ways to give customers something that they can't find elsewhere, i.e., more bang for their buck. Architectural and decorative film products are value-added options that have become increasingly popular in recent years. And one Florida company is taking strides to help see this market continue to flourish. Since 1981 Richard and Sue Purdum have owned Clearwater, Fla.-based Solar Graphics, a designer and installer of award-winning storefront window graphics. "We started the new business as a way to diversify because at the time there was a lot of competition in this area," says Richard Purdum, who began his career as a tinter in 1970. "We started by overlaying the films and at the time we were hand-cutting everything." Purdum, who develops his own color films, tells WINDOW FILM magazine, though, that the company has seen continuous, steady growth since its start. In 1989 the company began training dealers and tinters to create their own film graphics. "We have a training facility here and offer and three-day training program for experienced tinters," says Purdum, who adds that they are currently working with dealers worldwide and have projects in a number of different countries. "This type of product that can help any dealer go a step above (where they are already at)," says Purdum. To showcase some of these innovative projects, last July Purdum began a "Windows of the Week" newsletter, which highlights a unique storefront or window display. "The 'Windows of the Week' includes a brief bio of the project's design and creation. The newsletter also gives the tinters a good idea of what they can do and it's interesting for them to see the different designs that are possible. "We've attracted a lot of attention by sending it out," Purdum says. And now, as architectural glass sizes and projects are getting bigger and bigger, Purdum says he is starting to get a lot of calls from architects and is also working a lot more with architectural glass companies and the architectural film industry. "When an architect calls (for a job in Texas) I need to be able to recommend a tinter in that area that can do the job," says Purdum. "We're working together to create that connection and the opportunities in the market are incredible." As far as future plans, Purdum says they are going to continue to focus on the architectural market and also developing their distributor base. He is also exploring new technologies. "We're starting to veer some into digital printing onto films. This is normally two-thirds the cost of the films graphics, which are computer cut layouts," says Purdum, who adds that he is still enjoying everything about the business. "We're having fun and enjoying what we do and that's the key. I like it when a dealer calls me and tells me that he's proud of the work he was able to create; and the business owners love it, too," he says.